Tanzania, officially the United Republic of Tanzania, is a country in Eastern Africa within the African Great Lakes region. Parts of the country are in Southern Africa. It is bordered by Kenya and Uganda to the north; Rwanda, Burundi, and the Democratic Republic of the Congo to the west; Zambia, Malawi, and Mozambique to the south; and by the Indian Ocean to the east. Mount Kilimanjaro, Africa's highest mountain, is in northeastern Tanzania. Tanzania's population of 51.82 million (2014) is diverse, composed of several ethnic, linguistic and religious groups. Tanzania is a presidential constitutional republic, and since 1996, its official capital city has been Dodoma, where the President's Office, the National Assembly, and some government ministries are located. Dar es Salaam, the former capital, retains most government offices and is the country's largest city, principal port, and leading commercial centre. Tanzania is a one party dominant state with the Chama Cha Mapinduzi (CCM) party in power. From its formation until 1992, it was the only legally permitted party in the country. This changed on 1 July 1992, when amendments to the Constitution and a number of laws permitting and regulating the formation and operations of more than one political party were enacted by the National Assembly. Elections for president and all National Assembly seats were last held in October 2015. The CCM holds approximately 75% of the seats in the assembly. The first issue of Tanzania proper was a set of four commemorative stamps marking the union, issued 7 July 1964. Inscribed "UNITED REPUBLIC OF TANGANYIKA & ZANZIBAR", two values depict a map of the coast from Tanga to Dar-es-Salaam along with Zanzibar and Pemba, while other two show hands holding a torch and spear. The first definitive series was issued 9 December 1965, and consisted of a set of 14 values ranging from 5 cents to 20 shillings, depicting a variety of scenes, symbols, and wildlife. 09.12.1965 "first definitive set"  15.01.1977 "2nd World Black and African Festival of Art and Culture"  22.04.1988 "Animals"
30.06.1994 "Prehistoric animals" 26.12.1994 "Prehistoric animals"  30.04.1999 "Prehistoric animals"
 On December 9 1965 Tanzania issues a set of 14 stamps shows some typical animals, landscapes and some historical episodes to show development of the country. (Some of these stamps have been overprinted later on). 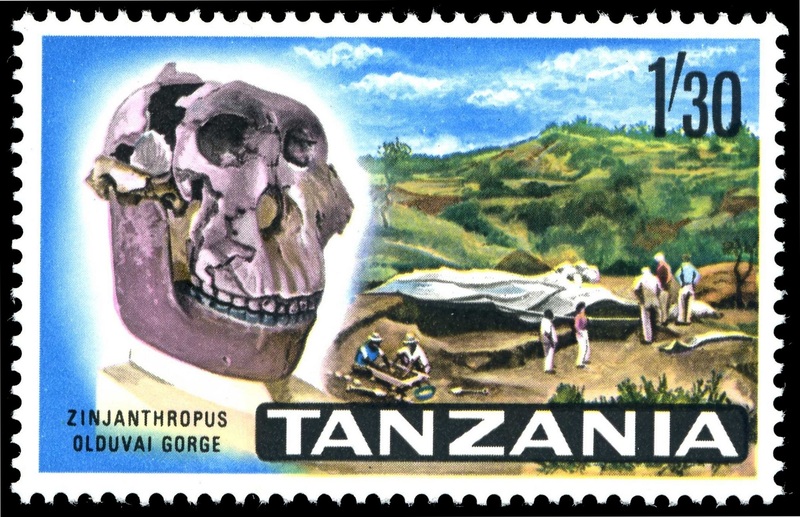 The 1.30sh stamp shows a skull of Zinjanthropus and its excavation site at Olduvai Gorge valley, the place known as “cradle of humankind.”. Zinjanthropus, later categorized as Paranthropus boisei, is an extinct hominid postulated from a skull discovered in Olduvai Gorge, Tanzania, by British paleoanthropologist, Mary Leakey (who is honored on Great Britanian's stamp in 2013) on 17 July 1959. 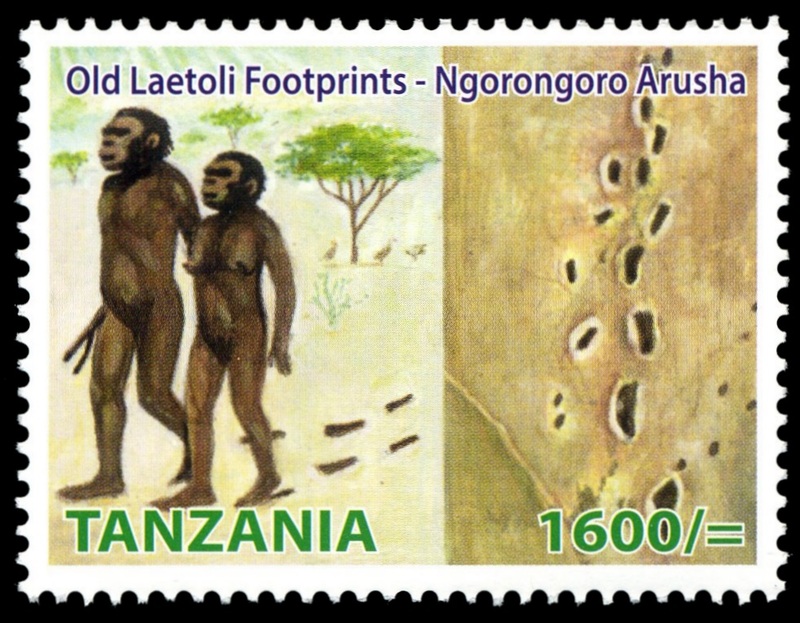 Olduvai Gorge can be seen on several stamps of Tanzania and Kenya. "2nd World Black and African Festival of Art and Culture" stamps issued by East-African community of Great Britain: Kenya, Uganda and Tanganyika/Tanzania in 1975 and later on as joint issue of independent countries: Kenya, Tanzania and Uganda in 1977. In 1977 these stamps issued in separate sheets as well as in mini-sheets. Festac '77, also known as the Second World Black and African Festival of Arts and Culture (the first was in Dakar, 1966), was a cultural jamboree held in Lagos, Nigeria, from 15 January 1977 to 12 February 1977. The month-long event celebrated African culture and showcased to the world African music, fine art, literature, drama, dance and religion. About 16,000 participants, representing 56 African nation and countries of the African Diaspora, performed at the event. 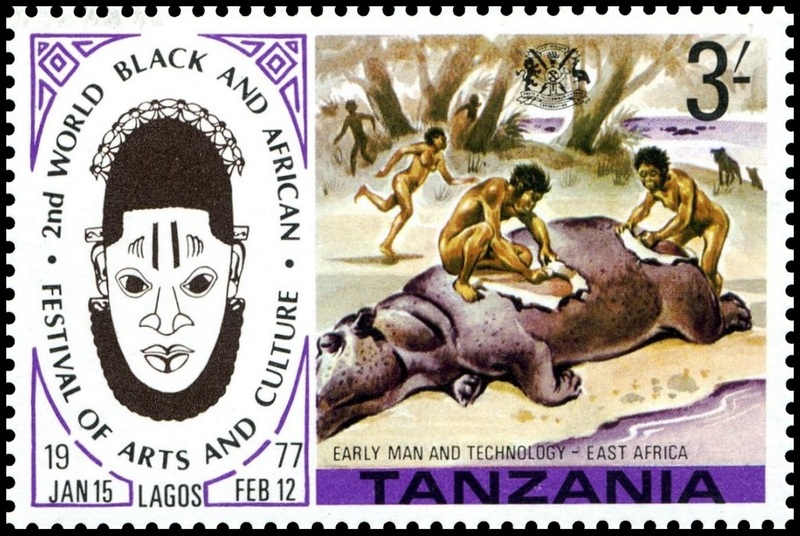 Stone age primitive mans butchering a Hippopotamus shown on a buttom-right stamp of the mini-sheet. "Tanzania heritage sites" set shows various sightseeing location of the county. 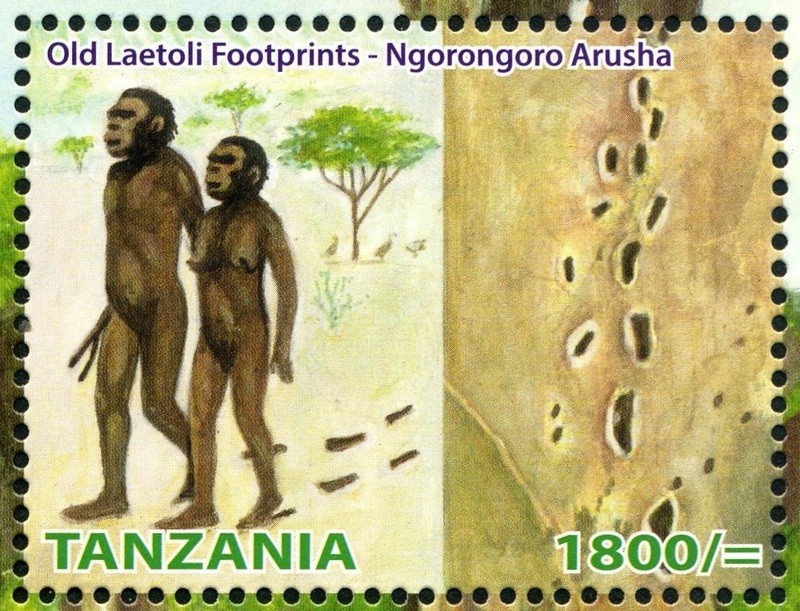 One stamp and one block shows two walking hominids and their footprints, known as "Laetoli footprints". The stamps are the same except the face value. Laetoli is a site in Tanzania, dated to the Plio-Pleistocene and famous for its hominin footprints, preserved in volcanic ash. The site of the Laetoli footprints (Site G) is located 45 km south of Olduvai gorge. 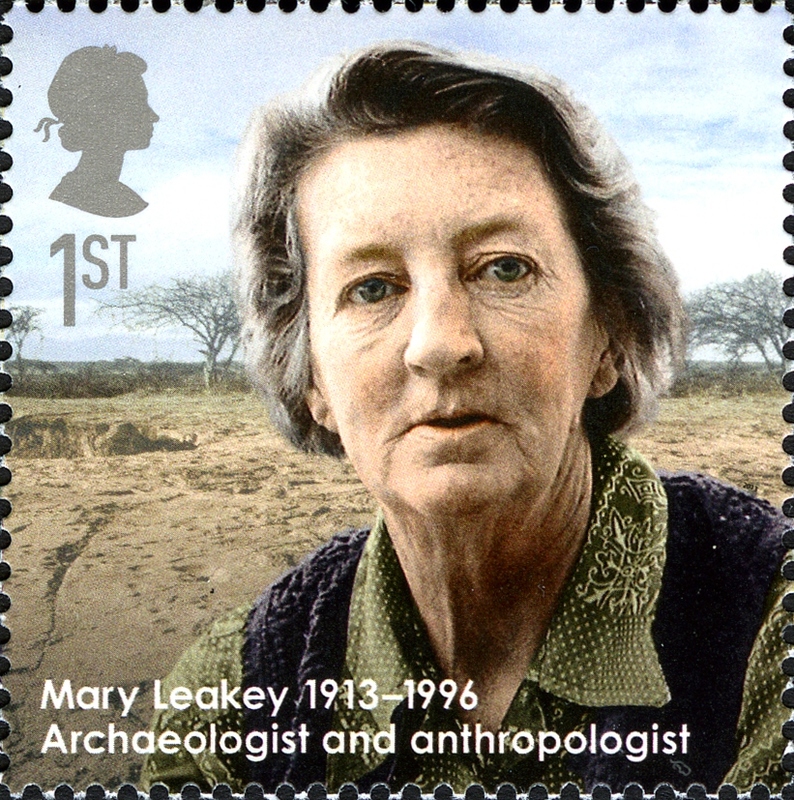 The location and tracks were discovered by archaeologist Mary Leakey in 1976, and were excavated by 1978.